James Bond's mission is to find out who has been smuggling diamonds, which are not re-appearing. He adopts another identity in the form of Peter Franks. He joins up with Tiffany Case, and acts as if he is smuggling the diamonds, but everyone is hungry for these diamonds. He also has to avoid Mr. Wint and Mr. Kidd, the dangerous couple who does not leave anyone in their way. Ernst Stavro Blofeld isn't out of the question. He may have changed his looks, but is he linked with the heist? And if he is, can Bond finally defeat his ultimate enemy. American actor John Gavin was signed to play James Bond in this movie. At the last minute, Connery returned and producer Albert R. Broccoli insisted that Gavin be paid-out the full salary called for in his contract. Production Design by Ken Adam. 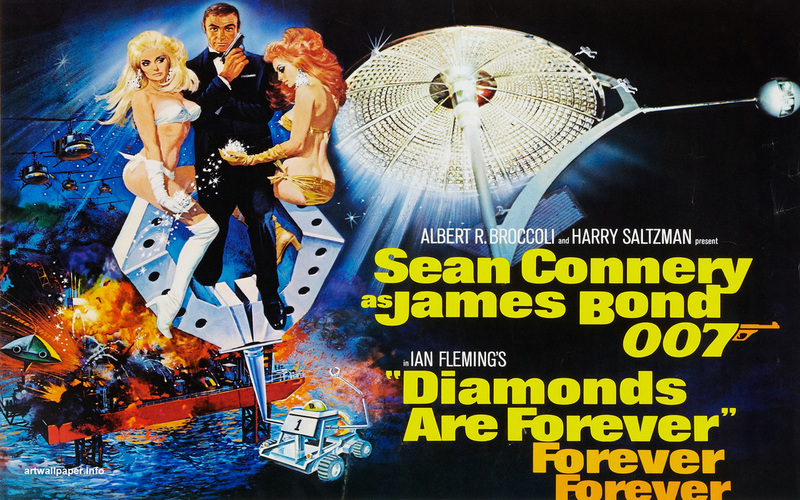 Title Song by Shirley Bassey "Diamonds Are Forever"
"My God! You just killed James Bond!"